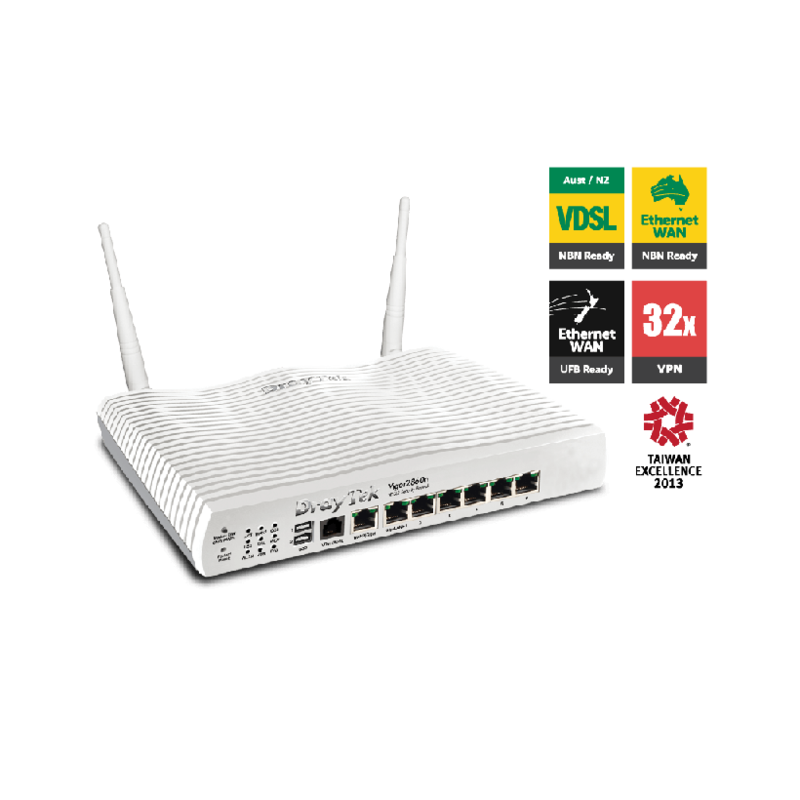 The Vigor2860n Combo WAN Router provides multi WAN ports, ADSL2+/VDSL2/Gb Ethernet and 3G/4G LTE USB configurable WAN to allow simultaneous convergent tenant connections, especially for FTTx-MDU, mobile broadband operators involved in rural broadband deployments. With the multi-WAN accesses, Vigor2860 series router supports multi-wan fail-over and load-balancing for USB WANs, VDSL2/ADSL2+, FTTx broadband. If your premise can not subscribe fixed broadband line, you can rely on the 3G/4G LTE (connected to USB WANs) as primary connection. The Vigor2860n is with 2.4GHz wireless access point. The Vigor2860n is with IEEE802.11n to ensure best performance and encryption processing. In addition, IEEE802.11n allows you to have greater coverage and resilience to interference compared to previous wireless standards thanks to the Vigor’s antennae diversity arrangement and the MIMO technology. The Vigor2860n provides you with different levels of security including authentication (802.11x), encryption (up to WPA2) and methods such as DHCP fixing to restrict access to authorized users only and Mac address locking. Through the Web User Interface (WUI), you can see how many and which clients are currently connected and how much bandwidth usage they consume. The wireless VLAN function lets you isolate wireless clients from each other or from the “wired” LAN. You can set certain password for your guest to let guests access your WLAN with “password”. The Web-portal setup (log-in) can let you have four rules along with 4 multiple SSIDs. When users connect to your WLAN, they will be directed with your log-in screen before any Internet access is permitted. You can customize your Web-portal setup (log-in) page. The multiple SSID features can let your network administrator set up four common or distinct virtual wireless access points. e.g. those with SSID1 can access to your ERP, those with SSID2 can surf internet. With the button of WPS (Wi-Fi protected setup), your client PC can get its security keys by pressing the WPS button on front of the router. There are several wireless channels for you to choose the best channel where is with the least congested wireless traffic. DrayTek Vigor2860 series are implemented with AP Management to facilitate deployment of multiple VigorAP 810 SOHO-level access point and VigorAP 900 enterprise-level access point. You can have overview over the status of multiple APs. For multiple wireless clients, to apply the AP Load Balancing to the multiple APs will manage wireless traffic with smooth flow and enhanced efficiency.